LASIK India offers information on LASIK in India, LASIK cost India, LASIK hospital in India, Delhi, Mumbai, Chennai, Hyderabad & Bangalore, LASIK Surgeon in India. Eye is one of the most important parts of the human body. An eye provides us the vision. It enables us to enjoy the beautiful world. Eye helps in almost each and every work that we do, during the course of the day. So, it is very necessary that we should take proper care of our eyes. Many times we go through various eye problems. Therefore, for proper functioning of our eyes, we sometimes go for treatment or undergo a surgery. There are different eye surgeries available among them lasik laser eye surgery is the most popular one. LASIK stands for Laser-Assisted In Situ Keratomileusis and is a procedure that permanently changes the shape of the cornea, the clear covering of the front of the eye, using an excimer laser. A mechanical microkeratome (a blade device) or a laser keratome (a laser device) is used to cut a flap in the cornea. A hinge is left at one end of this flap. The flap is folded back revealing the stroma, the middlesection of the cornea. Pulses from a computer-controlled laser vaporize a portion of the stroma and the flap is replaced. 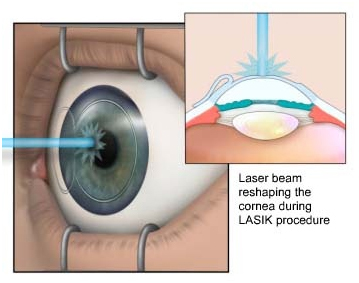 LASIK means using a laser underneath a corneal flap (in situ) to reshape the cornea (keratomileusis). This procedure utilizes a highly specialized laser (excimer laser) designed to treat refractive errors, improve vision, and reduce or eliminate the need for glasses or contact lenses. This laser procedure alters the shape of the cornea, which is the transparent front covering of the eye. There are a variety of different types of lasers used in ophthalmology. All LASIK procedures are performed with a specific type of laser (excimer laser), so in one sense, all LASIK procedures are similar. Further, there are different types of laser ablations that can be performed ,including conventional laser treatments, wavefront-optimized treatments, and wavefront-guided treatments. Finally, a completely different type of laser (femtosecond laser) can be used instead of a mechanical microkeratome to create the LASIK (corneal) flap. conventional LASIK is the ablation pattern available on most lasers that treats directly based upon the patient's glasses prescription, with fixed treatment parameters for each patient. This type of treatment is effective for most patients but can result in more visual aberrations such as glare, halos, and night vision issues than other forms of laser treatment. Refractive surgery is not for everyone. In addition to having a complete eye exam, there are certain questions you should ask yourself before considering LASIK or other refractive procedures. Am I willing to accept a low but real risk of surgical complications? Even though modern LASIK is extremely safe with rare complications, there are still times when unavoidable complications occur that can negatively affect your vision. Does my career allow me to have LASIK? Although there are now very few organizations that prohibit their employees or members to have refractive surgery, if there is any doubt, then it is important to ask your employer, professional society, or military service whether or not it is allowed for you to undergo refractive surgery. Has my vision been stable long enough to have LASIK? While minor changes in your prescription are not uncommon from year to year, if your prescription continues to get progressively stronger (for example, more myopic, more hyperopic, or more astigmatism) each year, then you may not yet be a good candidate for refractive surgery. Do I have any health conditions that make me a poor surgical candidate? Certain advanced autoimmune diseases, such as lupus and rheumatoid arthritis, may influence postoperative healing. Do my recreational activities make me a bad surgical candidate? There is a lifelong risk of LASIK flap dislocation if there is significant trauma to the eye, so people who participate in contact sports such as boxing, martial arts, or wrestling are not likely not be a good candidate for LASIK. In these instances, other refractive procedures, especially surface ablation, may be more appropriate choices. Am I too young or too old to have LASIK? There are no hard and fast rules about the appropriate age to have LASIK. However, patients under age 18 are rarely stable enough for LASIK, and older patients may begin to develop cataracts or other eye health issues that preclude them from undergoing LASIK. Again, the best way to determine these things is have a complete eye exam. Keratoconus is a corneal disease resulting from decreased corneal strength that can be detected as an abnormal curvature on testing. Patients that have evidence of keratoconus are not candidates for LASIK or surface ablation, but new technologies may become available for these individuals. Herpes simplex or Herpes zoster (shingles) involving the eye area. Glaucoma, glaucoma suspect, or ocular hypertension. Eye injuries or previous eye surgeries. What should I expect before, during and after surgery? What you should expect before, during, and after surgery may vary slightly from patient to patient and from surgeon to surgeon; however, the information listed below is a general guideline for the LASIK process. Each patient may also have slightly different expectations, and it is important to talk to your eye doctor about these expectations before surgery. During this eye exam, your doctor should discuss certain topics with you, including whether you are a good candidate for refractive surgery. He or she should discuss the risks, benefits, and alternatives of the surgery, and what you should expect before, during, and after the procedure. Your doctor should also explain what will be expected from you before, during, and following the surgery. It is quite important that you ask questions during this examination, and ideally you should already have the questions you want answered in mind before your examination. You will need to think about all of the risks and benefits and take time to review handouts that are provided to you by your doctor. After you have had plenty of time to think about these issues and had all of your questions answered, you will need to sign an informed consent form. It is not recommended to have your initial evaluation and surgery performed on the same day, as this does not give you enough time to fully contemplate your decision. It is also not ideal to first meet your surgeon on the day of surgery, because this again does not give you ample time and opportunity to ask the questions only your surgeon can answer before your procedure. After you are lying down and have been positioned underneath the laser, numbing eye drops will be placed in your eyes, and the area around your eyes will be cleaned thoroughly. After your surgical team, including your surgeons and assistants, have reviewed and confirmed all of your treatment information, a lid speculum will be placed to keep your eyelids open during the surgery. When it is time to create the LASIK flap, a suction device will be placed on your eye that will fixate it. During this period, you may feel pressure that may be somewhat uncomfortable, and your vision will go dark for a brief period of time. Your doctor will then use the microkeratome to create the corneal flap. After the flap has been created, the microkeratome will be removed, the suction will be off, and your vision will return, although it will likely remain blurry for the remainder of the procedure. Your first postoperative visit should be scheduled within the first 24 hours following surgery. At that visit, your doctor will check your vision and examine your eyes. You will continue to use your antibiotics and steroid drops as well as artificial tears. Your vision should be clearer but may still be blurry the first few days after surgery, and you may need to adjust your work or travel schedule or even take some time off after surgery to fully recuperate. You should not hesitate to call your eye doctor immediately if you develop worsening or unusual symptoms at any time after surgery. With careful patient screening and selection, reasonable expectations, and in the care of an experienced surgeon, most patients will be very pleased with their results.